Home - What is the Goethe-Test PRO? 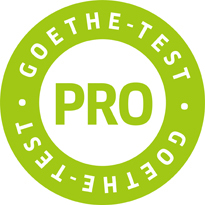 The Goethe-Test PRO is a German language assessment service. By testing a number of linguistic skills, the Goethe-Test PRO produces accurate language profiles of candidates. What is the Goethe-Test PRO? The Goethe-Test PRO is a computer-based language assessment test containing test comprehensions of Reading & Listening, Grammar and Vocabulary. The Goethe-Test PRO last for about 60 - 90 minutes. The language level is determined using the adaptive test method. That means, the level always adapts to the answer of the previous question.